Hot summer days were made for sippin’ rosé poolside. 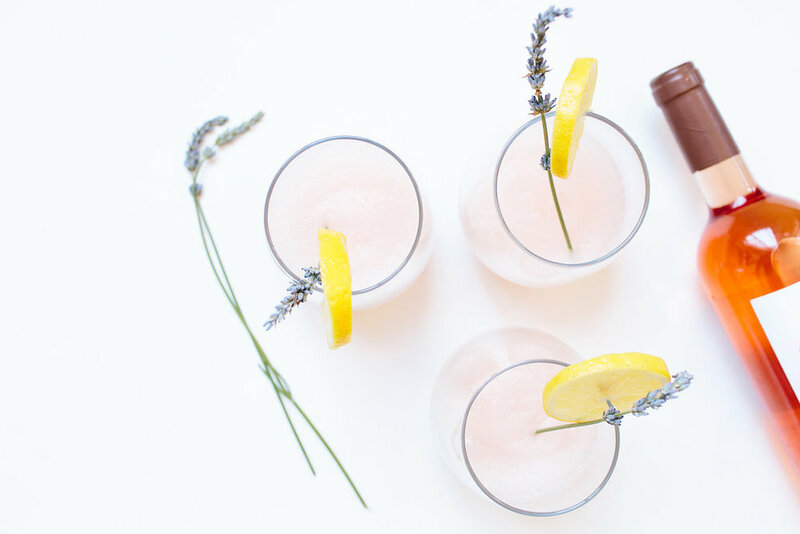 And while rosé is perfectly delicious and refreshing right out of the bottle, it reaches new heights as frosé—a brut rosé sweetened ever so slightly with homemade lavender simple syrup then frozen to a slushy consistency. When selecting your wine, choose a brut rosé that’s light in color—a lighter pink usually indicates a wine that is less sticky sweet—and, of course, a beautiful bottle is a must for summertime entertaining. Pour rosé into ice cube trays and freeze for 8 hours or overnight (note: this will not freeze solid). Combine sugar and ½ cup water in a small pot and bring to a boil. Reduce sugar and water to a simmer and stir until sugar has dissolved. Add lavender and remove from heat. Transfer lavender simple syrup to a heatproof glass bowl and bring to room temperature. Then place in refrigerator to chill until cold. (WHY? #1) Remove and discard lavender. Add rosé cubes, lemon juice, 2 TBS simple syrup, and 1-cup ice to a food processor and pulse until smooth. Transfer frosé to a pitcher and freeze up to 60 minutes, or until frosé has thickened. Return to food processor and pulse a few times to achieve a frosty consistency. Pour into individual glasses and garnish with slice of lemon and remaining lavender. WHY? #1: if you do not cool the simple syrup before adding to rosé it will melt the rosé ice cubes. If you don’t have a food processor, try using a high-powered blender instead. Save the remaining lavender simple syrup in a glass jar in your refrigerator. Use the syrup in other cocktails, or toss a tablespoon into a berry salad.